The Costa Brava enjoys a typically Mediterranean climate, characterised by long, hot summers and mild winters. Average temperatures are remarkably pleasant throughout the year, with a large number of sunshine hours. This makes our destination an ideal place for the practice of outdoor sports, such as golf, all year round. From March to May, temperatures are mild and sunshine hours increase by the day. The average maximum temperature is in the region of 18 ºC and the minimum is approximately 11 ºC. Summer temperatures, from June to September, rise but do not generally exceed a maximum of 28 ºC in July and August, which are the hottest months of the year. Rainfall in summer is limited and generally takes the form of an occasional summer storm to cool down the air before the sun comes out again. 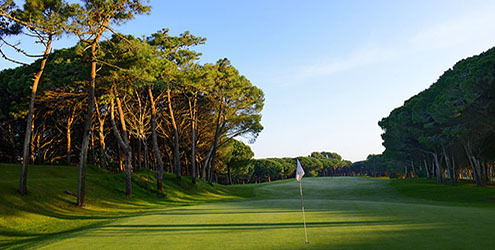 The course’s seaside location combined with its design – fully surrounded by a vast pine forest – make it the ideal course for a round of golf in summer. The long, sunny days continue with mild temperatures of 21 ºC in October and 16 ºC in November, on average. The maximum and minimum winter temperatures are 14 ºC and 7 ºC, respectively. The coolest month tends to be January though the temperature rarely falls below 5 ºC.